So, why would I want to review this 2-track EP by a little known female singer Scout Pare-Phillips? Number one - 'cause I want to, but, seriously, it is to direct your attention to this relatively young label, Pesanta Urfolk, which specializes in many things darker and folk metal. Scout Pare-Phillips is another part of The Sterling Sisters, a band also on Pesanta Urfolk, playing something of a dark country and Americana (with any luck we may have that band covered on these pages soon). 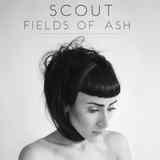 And, finally, if I reviewed Duncan Evans a few weeks ago, then why not Scout Pare-Phillips, since her 2 track EP Fields of Ash is pretty much a female version of Duncan Evans' Bird of Prey. Fields of Ash is dark acoustic folk rock you would like to meditate to. The opening title track carried by guitar, mandolin, but also sharp percussion and handclaps begins to showcase Scout Pare-Phillips deep and beautiful voice, both confident in its melodic inflections, yet trembling with female vulnerability. In the End is very much in the same vein, except everything is built around what seems like a pair of electro acoustic guitars or some other string instruments I am not fully qualified to describe.